Everything in Fort Tossenstein looks like fondant. Furnishings, lintels, standalone statues—the snowbound base’s interior details are broad and bulbous, wavy and swooping, conveying shapes but not convincing you of them; they’re decorative, but not practical. Were a character to break off a piece of a coffee table and eat it, you’d not be surprised. That doesn’t happen in The Wildcat, but it could have. 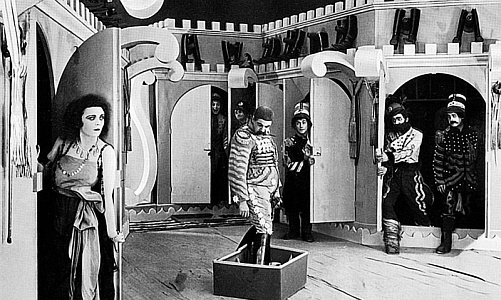 Ernst Lubitsch’s 1921 effort is a piece of comic hyperactivity, unconstrained by plot or much else. It is not a sophisticated film, and would be offended to be so accused. Main characters Alexis and Rischka, and Alexis’ would-be father-in-law, the pompous Bavarian stereotype who commands the Fort, have only the simplest motivations. What matters here is what they do, not why. The Wildcat concerns, to the minimum degree it has to, the love life of Lieutenant Alexis (Paul Heidemann): an officer transferred to the Fort, and captured, en route, by mountain bandits. 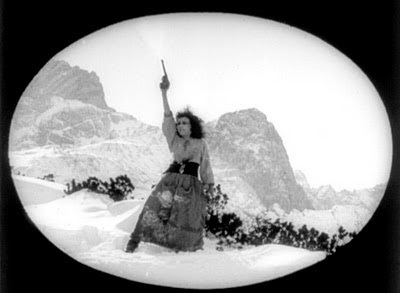 The bandits include Rischka, played vigorously by Pola Negri. She lets him go, but keeps his photo on the wall of her hut, along with his pants. The characters seem in on it, especially Alexis. He has little reason to frown, and so he almost never does. But he doesn’t quite smile either—it’s sort of a befuddled smirk. It’s hard to describe. Think of the smile you might put on if your wife ran into your girlfriend at the king’s dinner party, and no one could really afford to look bad, and so things are a little strained, but really, you suspect, you’ll be scoring a three-way out of it later. That kind of smile. Negri, who’s often described as “smoldering” and “exotic”, isn’t here. She’s practically feral: feared and lusted after by the rest of the bandits, whom she regularly beats the tar out of. They don’t much mind. Her Rischka is intrigued by Alexis, and the frothy interior of the Fort, and the various perfumes and powders women in there wear, but you get the impression she could take it or leave it all. If Heidemann, half-bemused, half-zoned-out, sets the tone of the film, it’s Negri, with her berserker energy, who sets the pace. Watch her grab Alexis for a lip-lock, hauling him into her lap like he’s her virginal bride. The Wildcat is already strange-looking film, with its blunt fakery and glamorous lead dressed in rags, hair looking like a shrub—but that isn’t enough for Lubitsch. No. He pulls us further into Weirdsville by blocking off portions of images, literally distorting what we see. Lubitsch’s irregular black frames enclose what we’re looking at, effectively giving the scene a ‘shape.’ Some shapes are simple ovals, circles or rectangles, but others are elaborate, forming the outline of a woman’s lips, or an octagon, or sharp teeth. 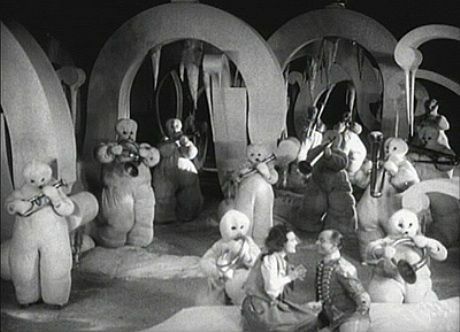 Lubitsch doesn’t frame every scene this way (thank god); but I’m not sure why he ever does it. This preoccupied me. Sometimes the shapes emphasize action, as when he uses a slanted rectangle to frame a slide down a snowy hill, but other times, the framing obscures what we’re looking at. And there’s no logical thread we can tie to the story itself. 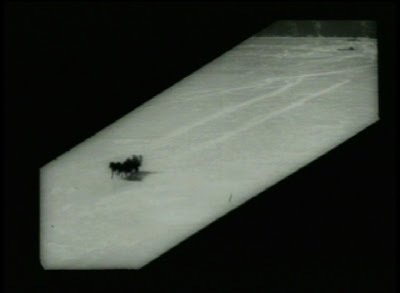 Yes, in one case, a character peers through a keyhole and the next scene is keyhole-shaped; in another case, a character uses binoculars, and the image is encased in a pair of circles. But no device is shaped like teeth. There's sort of a telescopic effect at work here. Looking at figures through a telescope trivializes them—they’re smaller than you, their affairs distant and puny. The more serious they take themselves, therefore, the sillier they become—and the dumber they seem, because they’re unaware of being watched. Lubitsch’s masking technique gives us a similar, superior attitude as observers—a status we’re unable to forget about, because Lubitsch makes the frame so intrusive. Only an audience can see a frame. The Wildcat loses steam in its last act. Here, and only here, does Lubitsch attempt a comedy of manners—challenging Rischka and Alexis to commit or cut bait. It’s a mistake, because their love story, up to now, has been driven more by the conventions of love stories than actual feelings. We know it, and so do they, and it was good. Still, the film is as close as the Silent Era gets to the Marx Brothers or even Monty Python: subordinating everything to the joke, including, I think, the joke. For that, and for the unique aesthetic it delivers, The Wildcat is easy to recommend. The Wildcat (Die Bergkatze) is available on DVD through Kino International. I understand that the extensive creative framing practiced by Lubitsch in "The Wildcat" was intended as a parody on D.W. Griffith penchant for the device. I can certainly see that... but didn't Griffith's iris shots always 'move'(that is, wink in and out)? Here, the effect is static. It feels different. Great stuff, Chris. You capture the spirit of a very spirited movie. It has been a while since I read Chaplin's description of his relationship with Pola Negri, but I think "practically feral: feared and lusted after" fits pretty well. I have never seen framing devices used as much as they were in this one.